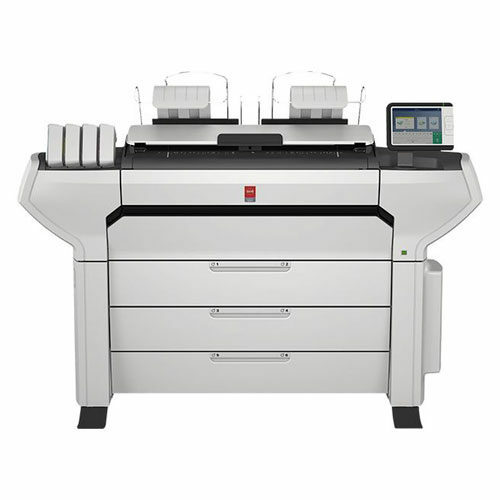 Designed for pure focus, the Océ PlotWave 345 and Océ PlotWave 365 printing systems offer technical users best levels of security, cost-effectiveness and simplicity. The perfect walk-up systems that make it easy for professionals to stay focused on their work and still get great looking, all weather proof technical documents. The right choice when you want to print faster, share faster and finish projects faster, while fully safeguarding your confidential information. Use a smartphone or computer to retrieve technical files from the cloud or send a print request to your printer via Océ Publisher Mobile. Optionally you can use LDAP credentials to access your home folder directly from the Océ ClearConnect panel. Save costly man hours and energy costs with our award-winning Océ Radiant Fusing technology. It goes from sleep mode to print in hand in just 40 seconds. Compared to a slow 2.5 minutes with conventional toner and inkjet printers, this can save you an hour a day and cut your energy costs in half. Save the time and money of sending files to an external printer with up to 2 rolls of media and a printing speed of up to 6 A1 or D-size prints per minute. Scan while printing and copy while printing to work even more efficiently. Fast and easy with Océ ClearConnect panel The user panel works like a tablet, as you can easily control the printer with your fingertips. Swipe, spread and zoom in on details of drawings or images. Check if documents are correctly positioned and avoid errors by using the live preview. Neat document delivery Get up to 50 E/A0-size neatly collated and stacked documents on the top delivery tray thanks to the air separation technology. Get better copy and color scanning results Océ Color Image Logic® automatically compensates for folds, wrinkles, and light colors to produce superior results. Originals are inserted face-up and paper width is detected automatically. Presets available for Grayscale, color, photo and blueprint originals. Instant productivity with Océ Radiant Fusing Get instant start-up and use half the energy of comparable systems. With a remarkable print speed up to 4 or 6 ppm (D-size/A1) and a first print out of 30 seconds you get instant productivity. Increase your productivity even more with the 2 roll option for unattended printing, and scan while printing. Effortless roll changing Save time and effort with the built-in roll loading station. Once loaded, paper is fed into the printer, cut and sized – completely automatically. Roll changing is simple and easy, with motor fed media loading, media cutter in the drawer , and automatic media width detection. Manual feed of cut sheet media is supported. Reliable quality and performance Take advantage of a superb print quality with high resolution Pico Printing at 600×1200 dpi. Océ Image Logic automatically detects width of originals to ensure first time right results. Eco friendly system The system has very low ozone emissions, low levels of heat and is “whisper quiet” at only 24 dB(A) in standby and sleep. No noisy fans like conventional systems, so it can be easily placed into virtually any environment. Flexible workflow The system is designed to make it easier to prepare, produce and manage complex technical documents and sets of drawings. 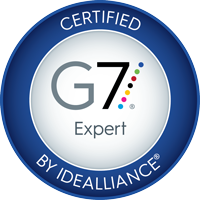 Advanced software tools make it a breeze to get documents where you need them, when you need them. Safeguard your security Protect confidential information with the latest FIPS 140-2 certified security features supported by a Windows 8 embedded platform and our POWERsync controller. The open interface of the POWERsync controller also enables the printer to fit smoothly into existing software, like uniFLOW, and hardware without worrying about operational or security issues. 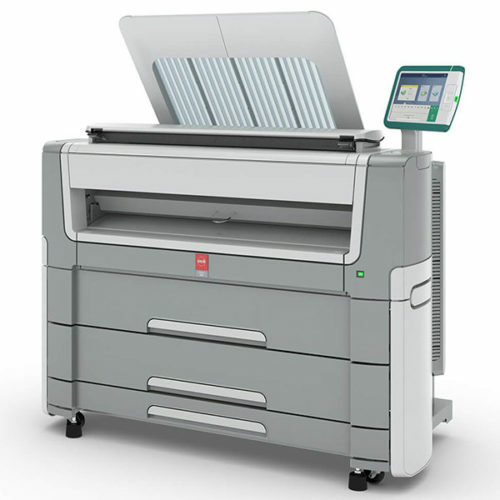 1 Roll (standard) or 2 Rolls printing system Productive Wide Format B&W printer with Océ ClearConnect multi-touch user panel. Stacking systems (standard) Integrated Top Delivery Tray. 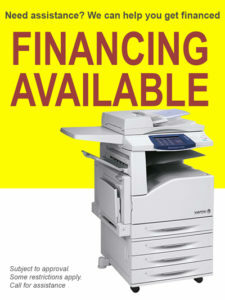 Up to 50 sheets E-size/A0 capacity. Océ ClearConnect multi-touch user interface (standard) Consistent look and feel from every angle of your workflow, standard including Océ Smart Inbox, Océ Smart Access and Océ Live Preview. Océ media switch (standard) Full automated media switch, to guide the media to the top delivery tray or back output depending on the user application. Océ ClearConnect Workflow software (standard) Océ Wide format Printer Driver 2 for Microsoft® Windows®, Océ PostScript® 3 driver, Océ Mobile WebTools for iOS®, Android® and BlackBerry®, Océ Publisher Mobile for IOS® and Android®, Océ Publisher Express, Océ Publisher Select 2. 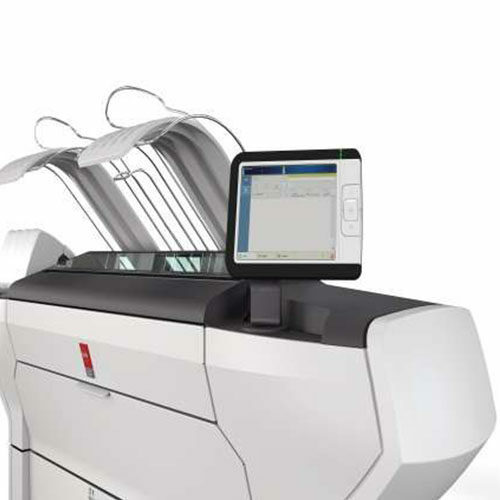 Productive scanning system (optional) Océ Scanner Express with Océ Image Logic technology. Folding systems (optional) Estefold 2400 fan folder. Level 0 (inline) integration with printer. Stacking Systems (optional) Océ Delivery Tray provides an additional 150 sheets (E-size/A0) capacity. Increase your total stacking capacity from 50 (Top Delivery Tray) to 200 sheets. Media capacity upgrade (optional) 2nd roll option to increase media capacity from 1,950 to 3,900 square feet (183 to 365 m2). Workflow software (optional) Oce Direct Print Pro/Lite, Oce Publisher Select 2, Adobe® PostScript ®3/PDF file interpreter, Océ Repro desk, Océ Account Center, Océ View Station. Hardware (optional) 2nd roll. Océ Scanner Express. Removable Hard Disk. Climate Control. Estefold 2400 fan folder. Océ Delivery Tray. TPM module (required with Disk Encryption option). Starter kit included 1 bottle toner (400 g), 1 bottle developer (1,750 g), 1 roll 36 inch 20 lb bond paper (75 g/m2). 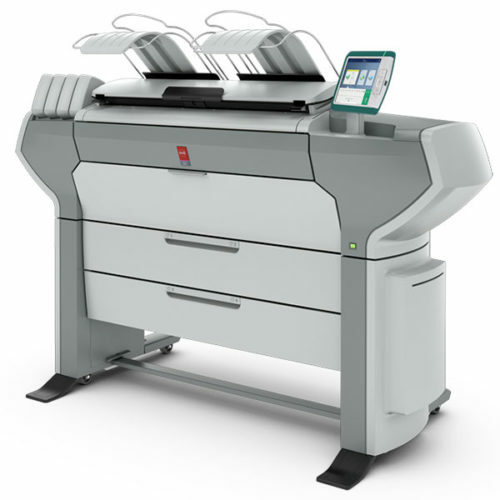 Incredibly fast print out Print speed up to 4 ppm D-size/A1 (Océ PlotWave 345), up to 6 ppm D-size/A1 (Océ PlotWave 365). Virtually Silent* in Standby and Sleep (*under 25 dB) Radiant Fusing technology eliminates noise. Fusing technology Océ Radiant Fusing. Instant warm up. Maximum paper capacity 1 Roll (650 ft L x 36″ W): 1,950 sq ft.2 Rolls (650 ft L x 36″ W): 3,900 sq ft.
Media weight Bond: 16 – 28 lb (60 – 110 g/m2).Film: Polyester 3.5 mil. Back channel protocol: SNMP , Océ Wave interface, WS-Discovery. Security E-shredding, IPSec, IP filtering/Access Control Lists, HTTPS, audit logging, network protocol enable/disable, LDAP integration, Active Directory Integration (optional),User authentication on local ClearConnect user panel (LDAP/Active Directory credentials, smart card) for scan/copy/print. Configure HTTPS Certificates. Removable hard disk option, Optional FIPS 140-2 Certified Trusted Platform Module (TPM) and BitLocker based hard disk encryption, hard disk wipe (Only with Disk Encryption), Configurable CA certificate, Disable Network Ports and Protocols, Security Event Logging, Optional Single Sign-on (on device). Scan destination Local USB flash drive, FTP, SMB, Smart Inbox on Controller, Optional Local Home folder (LDAP), mobile device via Océ Mobile WebTools, WebDav Clouds. Scan naming Preset naming with auto numbering for productive scanning or file name on the ClearConnect user panel keyboard. Recyclables Printer: made of steel or highly recyclable plastics: up to 95% of the engine can either be upcycled or recycled. Remaining 5% are non toxic waste. Job submission Create, retrieve and/or send jobs from drivers (Océ Wide format Printer Driver 2 for Microsoft® Windows®, Océ PostScript® 3 driver for Microsoft® Windows® or Apple® OS ), external locations (SMB, FTP, LPR, WebDav), Mobile devices via Océ Express WebTools and Océ Publisher Mobile, USB flash drive, Cloud services and optional Home folder(LDAP). 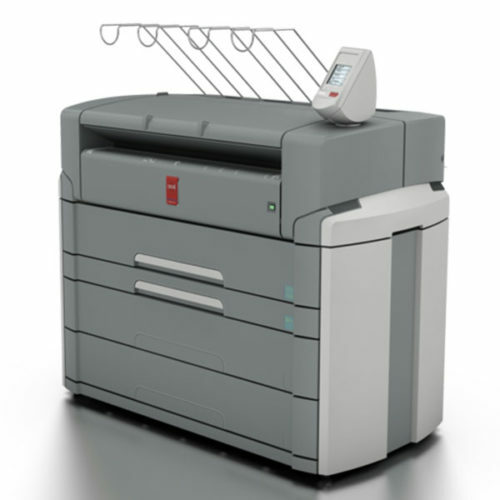 1-click printing from USB, 1-click printing from last send jobs via Print Smart Access on Océ ClearConnect user panel. The Smart Inbox on the Océ ClearConnect user panel enables job preview: swipe between your jobs for print selection and preview. Pan to view the image in detail (zoom). With the template oriented Publisher Select 2 submitter for Microsoft Windows, multiple files are supported. Print multiple times, and sort by page or set. Media saving automatically rotates print files to optimize media usage. Queue management Spool memory provides a queuing system for print and copy jobs. This allows multiple users to send print and copy jobs at the same time. Customize priority settings for copy and print jobs in the queue. The Job queue overview gives access to job names, owners and status including required media. Jobs can be paused, deleted and placed on top of the queue. Print management View counter history at preferred time periods, per job or total overview. View, create, edit and delete stamp templates. Scan to file Océ Scanner Express offers full hybrid performance with its template based scan-to-file functionality. Scan to file in 3 easy steps. Insert the original in the Color scanner, Select the template of your choice and touch the scan button. Send files, via SMB, FTP,WebDAV, SNMP(optional) to various locations such as local drives, personal Smart Inboxes, Personal home folder via active directory (optional) or the cloud application of your choice. Scan to USB or use Océ Mobile WebTools and Océ Publisher Mobile to scan to mobile devices. Custom scan file naming to any location. Check plot functionality. Océ ClearConnect supports Live Preview during scanning on the user panel. Check and zoom in on every detail of your document thanks to the full preview functionality of the Océ ClearConnect user panel or remote on your PC. Océ ClearConnect multi-touch user interface Océ ClearConnect enables a consistent view on your workflow from every possible angle, and job management is made easy. Default jobs can be performed by only clicking the green button (SmartAccess for Print, Scan and Copy). Behavior is customizable via Océ Express WebTools. Edit the most common used job settings for copy, scan, and print jobs. Presets can be defined in Océ Express WebTools. The Smart Inbox supports multi-user environments and 1-click printing via the SmartAccess for all users. Thanks to the virtually unlimited number of Scan Templates (up to 200), scanning is as easy as 1-2-3. Insert your original, select the template of your choice and touch the Scan Button for the best scan quality thanks to Océ Image logic. The Océ Express WebTools controller application supports customizable workflows. Separate work spaces give you a complete overview and full control over print and scan job management. Tasks you can manage are: Settings and configuration management, Network connectivity management, Queue management, License management, System monitoring, Scan retrieval, Print job submission. You can access the integrated Océ Express WebTools controller application from any networked workstation. Job Queue view to check the status of your job in the print Queue, available wherever you are with a single click. The Océ ClearConnect includes a context sensitive online help. Switch between languages easily on the Océ ClearConnect user panel. Use the Smart Inbox to view all jobs with status, job name and owner. Actions to print, print all, edit, send to…, delete and save. Custom sorting of jobs in list or group view. What you see is what you print with Wide-format Printer Driver. Open API for third party or own-developed applications integrated with the Océ ClearConnect user panel. Mobile and Cloud Print from and scan to the cloud application of your choice. With the help of mobile applications such as Océ Mobile WebTools and Océ Publisher Mobile the printer can be easily accessed and used from any location. The best of solid toner paired with inkjet printing technology uses accurate dot positioning to create crisp, vibrant graphics that dry instantly on plain and recycled media. 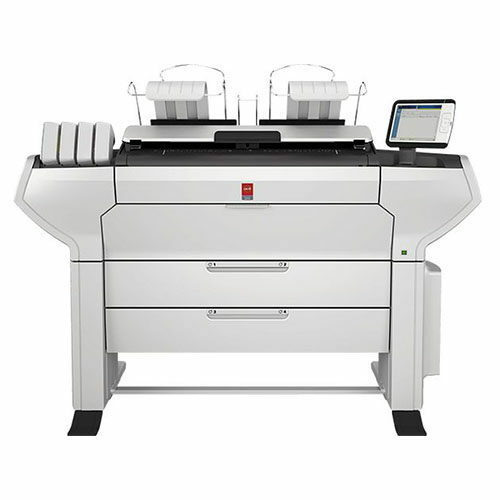 The wide format plotter delivers instantly dry prints, so there is zero drying time and your prints can be handled, stacked or folded immediately. 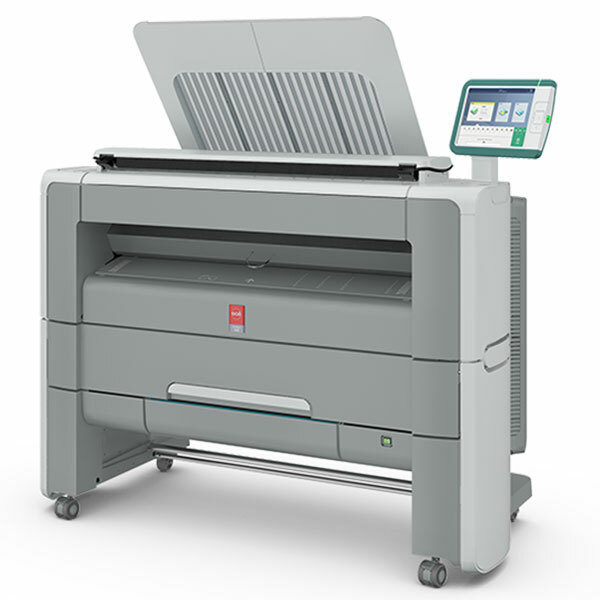 Like other members of the Océ large format family, this printer works just like a tablet thanks to the Océ ClearConnect user interface. The Océ ClearConnect software suite also gives you more flexible and effortless ways to submit and manage files. Print from your desktop via Océ Publisher Select? or Océ Direct Print software to manage complex document sets. You can even print from the cloud, your smartphone or tablet.